German hopes high but when play concluded in the Men’s Singles quarter-final round matches on the late afternoon of Saturday 25th August, at the Seamaster 2018 ITTF World Tour Czech Open in Olomouc, aspirations lay in tatters. Dimitrij Ovtcharov followed by Bastian Steger and Patrick Franziska all departed proceedings; it was not good news for the three players who, alongside Timo Boll. had been members of the squad that secured bronze in the Men’s Team event at the Rio 2016 Olympic Games. First to fall was Dimitrij Ovtcharov, the top seed; he was beaten by England’s Liam Pitchford in a contest between two players renowned for lethal backhands. Once again it was an earlier than anticipated exit for Dimitrij Ovtcharov, just as last year was “Annus Mirabilis”, with the Men’s World Cup title secured; this year has been “Annus Horribilis”. In five appearances on this year’s Seamaster 2018 ITTF World Tour, the quarter-final defeat in Olomouc is his best finish. Conversely, for Liam Pitchford, he is in a rich vein of form and is now in unchartered waters; his previous best on the ITTF World Tour being a quarter-final finish in 2013 in Germany and more recently in 2016 in Sweden; notably in the latter the player who ended his progress was a certain Dimitrij Ovtcharov! Revenge is sweet. Defeat for Dimitrij Ovtcharov was followed by a German defeat at the hands of a player who, like Liam Pitchford, had been required to compete in the two day qualification tournament; Bastian Steger, the no.13 seed suffered at the hands of China’s Zheng Peifeng (11-9, 11-5, 9-11, 7-11, 11-5, 11-4), a young man who clearly has a penchant for German adversaries. Last week in Bulgaria, he ended the hopes of Dimitrij Ovtcharov in round two. 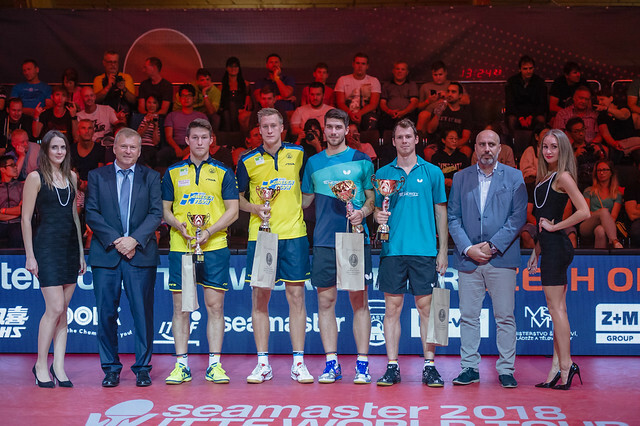 Disappointments for Dimitrij Ovtcharov and Bastian Steger, as the round concluded there was also defeat for Patrick Franziska, the no.9 seed, he was beaten by Japan’s Tomokazu Harmoto, the no.2 seed and defending champion (2-11, 11-4, 7-11, 11-9, 11-9, 11-8). At the semi-final stage, Liam Pitchford faces Zheng Peifeng; Tomokazu Harimoto confronts Portugal’s Marcos Freitas, the no.4 seed, the quarter-final winner in opposition to Austrian qualifier Daniel Habesohn (11-6, 9-11, 11-6, 11-6, 11-3). The matches will be played later in the evening session of play.